This business valuation course provides participants with the skills needed to perform detailed business valuation modeling using three main methods: Comps, Precedents and DCF Analysis. The valuation training provided in this series will be particularly valuable to those who are looking for a detailed and step-by-step explanation of how to value a company based on comparable companies, past M&A transactions and a Discounted Cash Flow Model (DCF). 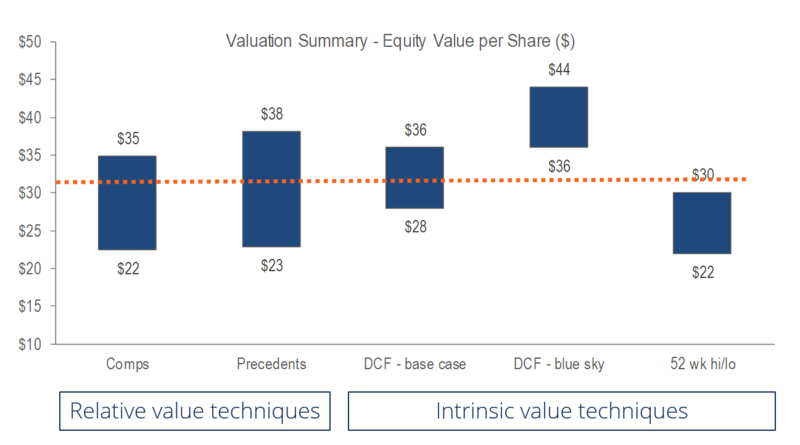 Learn how to value a business using discounted cash flow techniques. Complete Excel-based case studies and solutions as well as a PDF valuation reference guide that can be used while taking the course and downloaded to your computer for future reference. Learn how to calculate the cost of equity, cost of debt and the weighted average cost of capital. Learn how to build a Comps table and calculate all equity value and enterprise value ratios required to value a business. Learn about the main drivers of free cash flow to the firm and business valuation in this course. In this corporate valuation course, you will learn to build a DCF model from scratch, building on the skills you developed from CFI's prior courses on building a 3 statement model. 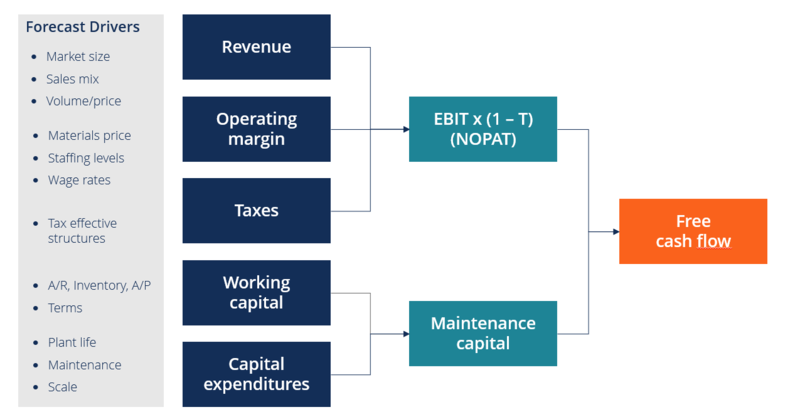 Learn how to perform weighted average cost of capital (WACC) analysis in Excel and use the slope function to calculate a company's beta. 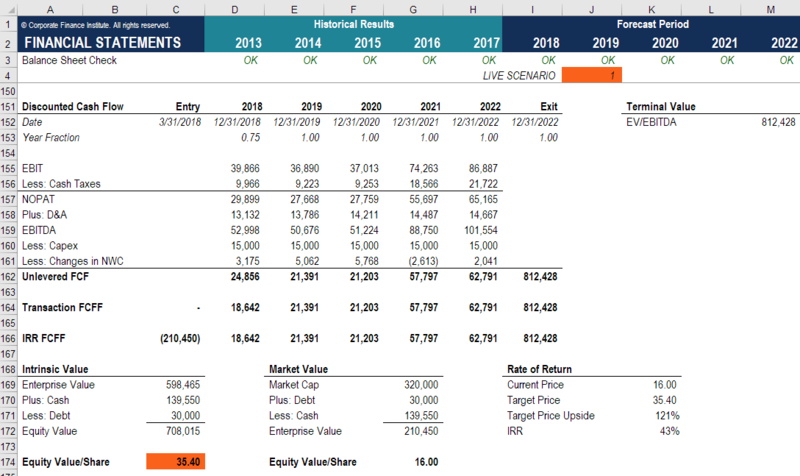 Create a football field chart in Excel (from scratch) at the end of the course to combine all methods used in the corporate valuation model built earlier in the class. Who should take this corporate business valuation course? This online class is designed for professionals working in private equity, investment banking, corporate development, and other areas of finance and accounting. The course provides both foundational building blocks for beginners and covers more advanced aspects of valuation for experienced practitioners. For beginners to advanced users, this corporate valuation modeling course is designed to teach you how to be a complete financial analyst. This course made something complex, so simple and easy. The step by step instructions and thorough theory material teaches us how to value businesses properly and gives us the guidelines on how to perform them under any scenario. Simply incredible... CFI you are the best. 5 stars. This is extremely helpful and very beneficial! Amazing work with the explanations, comparisons, definitions, and models! I am currently in San Francisco, working with startups doing accounting etc. These contract roles are few and far between at times. I think this knowledge would be a game-changer for me! The course is well detailed though it tends to get repetitive at times. The instructor did rush through Module 3 very fast and the learning time allotted to it was way too little, with the focus in this module more on learning rather than full and proper explanation. The last module did demand some prior knowledge which was not mentioned in the pre-requisites. 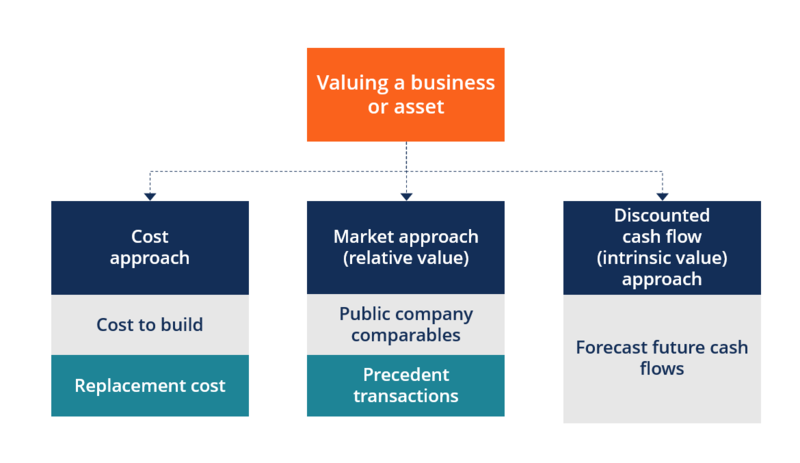 Excellent valuation techniques. I don't regret going through this course to discover the in-depth practicality on how to value Companies. Thanks for this course. Otherwise tricky concepts communicated in a very simple and easy to understand (but highly effective) way. This course provides a good overview of comps and precedents, how to pick relevant ones and how to adjust them for growth, margins etc. Easy to follow and very well explained, thank you!